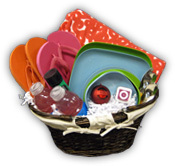 Enter here every day for a chance to win a CosmopolitanTV gift basket. His and hers flip flops? I make fun of couples who dress alike. Good Luck!